If Bill Maher has lost atheist sports writers, he’s lost America. Sally Jenkins, writing in the Washington Post explains her puzzlement at him. If God is liable to smite anybody around here, it’s me. When it’s smiting time, I duck, because I don’t believe in any religion that requires a building and loan payments. Nevertheless, I’m having a hard time seeing anything wrong with Tim Tebow taking a prayer knee in public. The knee seems a pretty plain and graceful statement, and it’s tiresome to see it so willfully misinterpreted. It’s the preachers from the top of Mount Idiot like Bill Maher who are hard to understand. Set aside the intriguing question of whether Maher would have the nerve if Tebow were Muslim. Or whether he’s funny. (He’s not, really. Monty Python is.) What’s more interesting is why Maher, and other political commentators from Bill Press to David Shuster, feel compelled to rip on Tebow simply for kneeling. Based on the first 2 sentences, I’m assuming atheism on the part of Jenkins. If I’m wrong, I apologize. However, whether or not she is doesn’t really take away from the point that the press and others seem to really have a huge problem with one guy taking his religion seriously, rather than shutting it in the closet while he’s at work. Ironically, these would be the same people who would (rightly) castigate Tebow for having an affair, or pilfering from teammates, or swearing up a storm; anything that would tend to be at odds with his testimony. And yet when he does things that line up with his religion, they still crack on him. You just can’t win with some atheists, eh? Now understandably, Tebow is a public figure and some of this comes with the territory. I’m not saying that Tebow is beyond criticism. But you can go over the line, and I think Maher and many others have done that. Criticism is one thing. But just like there is a right way and a wrong way to tackle an opponent, a cheap shot is quite another thing altogether. But why all this vitriol? Jenkins asks and answers. What is so threatening about Tebow? It can’t be his views. Tebow has never once suggested God cares about football. Quite the opposite. It’s Maher and company who stupidly suggest a Tebow touchdown scores one for Evangelicals whereas an interception somehow chalks one up for atheism. Anyone who listens to Tebow knows he doesn’t do Jesus talk, he’s mostly show and no tell. His idea of proselytizing is to tweet an abbreviated Bible citation. Mark 8:36. He leaves it up to you whether to look it up. When he takes a knee, it’s perfectly obvious that it’s an expression of humility. He’s crediting his perceived source, telling himself, don’t forget where you came from. On the whole, it’s more restrained than most end-zone shimmies. So why does Tebow’s expression of faith make people so silly-crazy? Why do they care what he does? Because he emphasizes the aspect of his talent that is given, not earned. And that makes people nervous. The reactions to Tebow seem to fall under the category of what theologian Michael J. Murray calls “Theo-phobia.” In his essay “Who’s Afraid of Religion?” Murray argues we’re ill at ease with intrusions of personal faith. We fear they could lead to oppression, or mania, or even prove us wrong. Basically, when you shine a light, it points out how dark it really has been. Here’s a guy who’s thankful for the talent he’s been given, rather than thinking he’s earned or deserved it (and we have seen countless times how that attitude has become self-destructive). If you tsk-tsk when a player is found with a gun at a bar, how can you possibly belittle a guy staying away from that because of his religion, who’s publicly showing it and is thus asking to be held accountable? You can belittle him, if you feel you have to, if doing so allows you to keep your feeling of superiority. If you’ve ever seen Maher in action, you know he’s got that. Which explains his animosity. If he doesn’t want to continue to look childish, he should just stay away from religious topics completely. The mechanical feats that have occurred at Olympic opening ceremonies keep getting more elaborate. Last night’s lighting of the cauldron in Vancouver would’ve been spectacular if not for the problem with one of the pylons that was to emerge from the floor. What a bummer. Nice idea, though. But the best cauldron lighting ever, in my mind, depended not on mechanics but solely on athleticism. 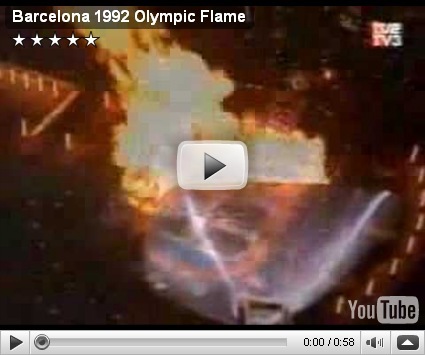 A million variables meant this could have gone anywhere from slightly to horribly wrong, but Paralympic archer Antonio Rebollo nailed an amazing shot to light the torch in Barcelona in the summer of 1992.